Built on BirdDog’s custom NDI silicon chip, the P100 PTZ camera is your entry into the world of full NDI. Featuring frame rates up to 1080p60, 10x optical zoom, and dual SDI and NDI outputs, P100 gives you professional level quality, performance, and total flexibility. Your entry into the world of NDI. 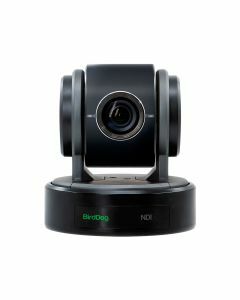 3.5mm audio connectors allow P100 to work with BirdDog Comms, the world’s first NDI audio intercom platform. Comms is a Windows 10 application that can run on any Windows 10 compatible computer, laptop, or surface for a touch screen experience. Ultra compact and lightweight, P100 has been designed for even the smallest of spaces making it ideal for house of worship, classrooms, corporate training, and live streaming. P100 can also be used as a traditional PTZ camera with RS422, RS485, and RS232 control allowing you to move into the world of NDI when you are ready. Combine P100 with BirdDog PTZ Keyboard for ultimate control. Use P100 as a source with BirdDog Central, the world’s best NDI delivery platform allowing you to send the P100 live camera to BirdDog NDI Decoders for extremely low latency display on any TV screen. NDI is an IP codec that comes in multiple flavours. BirdDog P100 uses the full quality version. Full NDI is an i-frame, variable bit rate codec with an extremely high signal to noise ratio and is designed to run over existing Gigabit networks. P100 is compatible with BirdDog Comms. Comms is a complete Audio Intercom solution which can run on any Windows 10 compatible computer, laptop, or surface for a touch screen experience.